Kirk Bell July 25, 2016 Comment Now! Editor’s warning: This article contains some geeky in-depth engineering information about what makes the 2017 Porsche Panamera tick. Reading it puts you in danger of learning more about this car than you thought you might want to know. What is the Golden Rule? Treat others as you would like to be treated, right? Not according to Porsche. The German sports car maker says the Golden Rule is to never release a new car with new engines and a new platform built in a new plant. With the 2017 Panamera, Porsche is breaking that rule, but we get the feeling this new Panamera will treat owners how they want to be treated. 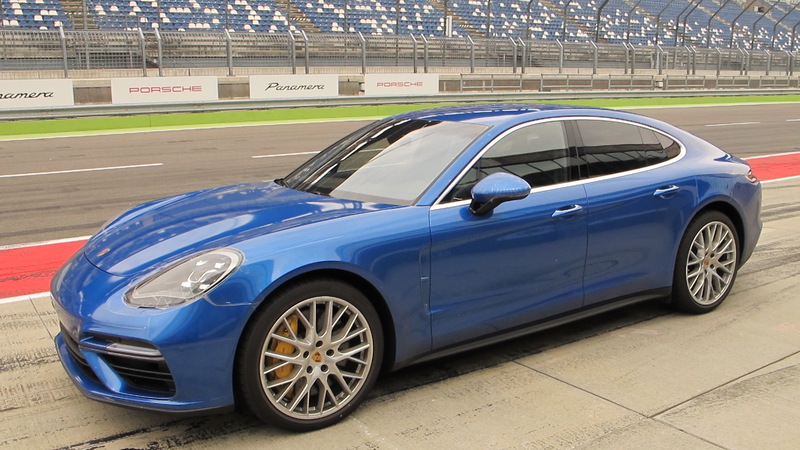 We learned some of the details of the Panamera just a few weeks ago, but Porsche is so proud of its new luxury sedan (actually, it’s a hatchback) that it invited Motor Authority to Dresden, Germany for a deep dive into what makes the second-generation Panamera tick. The first-generation Panamera was a fabulous car that delivered both luxury and performance in an admittedly odd looking package. It was a car that only needed some tweaks to the design and perhaps the electronics to make it great. Porsche is going far beyond that, though, as the company claims the only things that carry over are the idea of a sport sedan, the name, and the Porsche badge. The 2017 Panamera is the first vehicle on Volkswagen Group’s new MSB modular platform. Porsche says it is capable of accommodating up to three wheelbases and two of those will likely be used for the Panamera. The U.S. market gets what will be the short wheelbase first, though at 116.1 inches it is 1.2 inches longer than the outgoing model’s wheelbase. The track is increased slightly front and rear as well. Porsche is employing a multi-material approach to build a lighter, stiffer body. Aluminum is used for 31 percent of the body, including the outer skin, and high-strength Boron steel makes up another 31 percent of the body. The entire exterior skin is aluminum, which saves about 30 pounds. All told, the material mix saves 144 pounds while also giving the structure 8 percent more torsional stiffness. The whole body in white weighs in at 738 pounds. The car also has active aerodynamic components. Up front it gets active grille shutters that close at higher speeds for improved aerodynamics and during startup to help the engine warm up quicker. At the back is an active rear spoiler that rises to an “Eco” position when the grille shutters close at speed. At 124 mph, the spoiler changes to a “Max” position, the shutters open, and the car lowers a few millimeters. The rear spoiler splits and extends outward on the Turbo model, making it twice as big. CHECK OUT: Is that a jet-engine powered Charger on set for Fast 8? 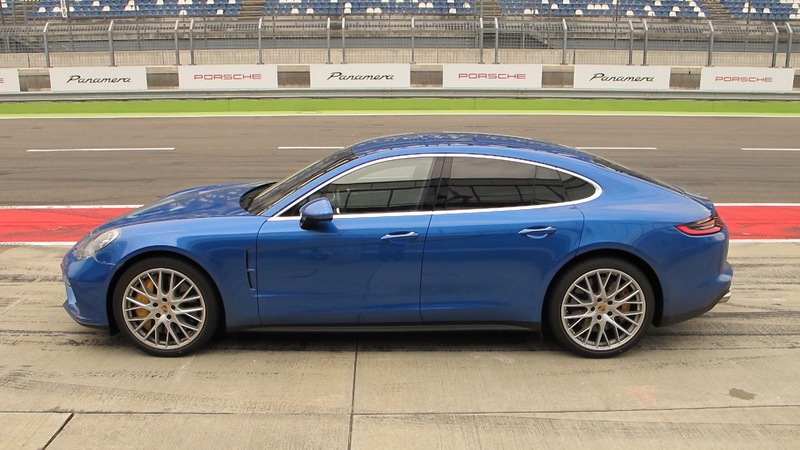 The base suspension of the 2017 Panamera is little changed from the outgoing model. It consists of a double-wishbone front suspension and a four-link rear suspension with coil springs. Like the outgoing car, the Turbo model comes standard with air springs. 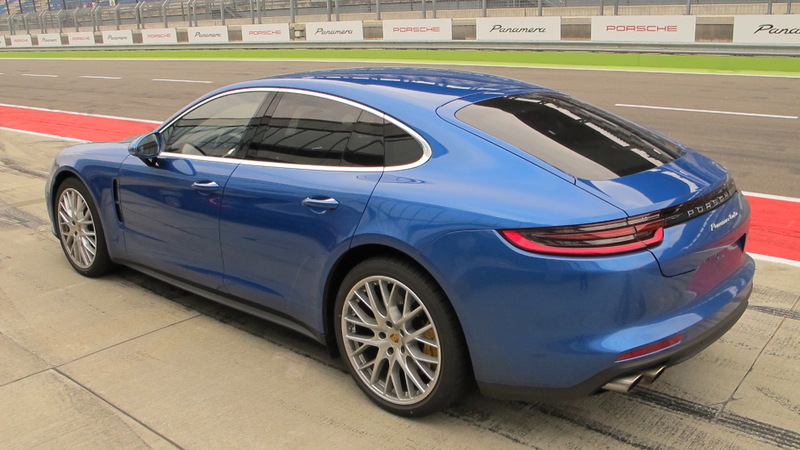 However, Porsche aimed to add more luxury to the Panamera’s considerable performance. The air springs now have three chambers instead of two and they push 60 percent more air volume, giving them a greater range of control, including more room along the comfort spectrum. Porsche says the new Panamera now competes directly with its closest competitors in terms of comfort. That’s saying a lot, given its main rivals include the Mercedes-Benz S-Class and BMW 7-Series. The air springs work in conjunction with Porsche Active Suspension Management, which is Porsche’s term for adaptive shock absorbers. These carry over, but Porsche says new lighter dampers improve responsiveness and increase the spread between comfort and sport settings. Of course, Porsche added two systems to help the car handle better, too. These consist of rear-axle steering and active stabilizer bars. The rear steering system moves the rear tires up to 2.8 degrees in the opposite direction of the front tires at low speeds to help the car turn more sharply and effective shorten its wheelbase. At higher speeds, the rears turn in conjunction with the fronts, though to a lesser degree, for greater stability. The active roll bars are called Porsche Dynamic Chassis Control Sport. This system uses electric motors that put a load into the front and rear active roll bars to stiffen them in a corner and thus keep the car from leaning too much. The Porsche Torque Vectoring Plus system carries over as an option. It uses both an active rear differential and targeted breaking of the inside wheel to send the power to the outside wheel in a corner to help the car rotate. All of these systems are controlled through a master brain that the company calls Porsche 4D Chassis Control. Basically, this system makes sure all of the systems work together to create the best ride and handling characteristics for the situation. Porsche says the four dimensions of 4D include the three spacial axes (x,y, and z), plus real-time control. All of this control requires a lot more computer programming to make it all work. Porsche says that the car’s total lines of code have increased from 2 million to 100 million and the control module count increases from 70 to 112. Of course the code includes engine and infotainment programming, but the various chassis controls certainly contribute considerably to that increase. Wheels, tires, and brakes have also been upgraded. While the last model used 18-, 19-, and 20-inch wheels, those sizes increase an inch this time around. The wheels are also a half inch wider and they are mounted on staggered tires. Tire sizes for the 4S are 265/45/R19s front and 295/40/R19s rear, while the Turbo gets 275/40/R20 front and 315/35/R20 rear tires. 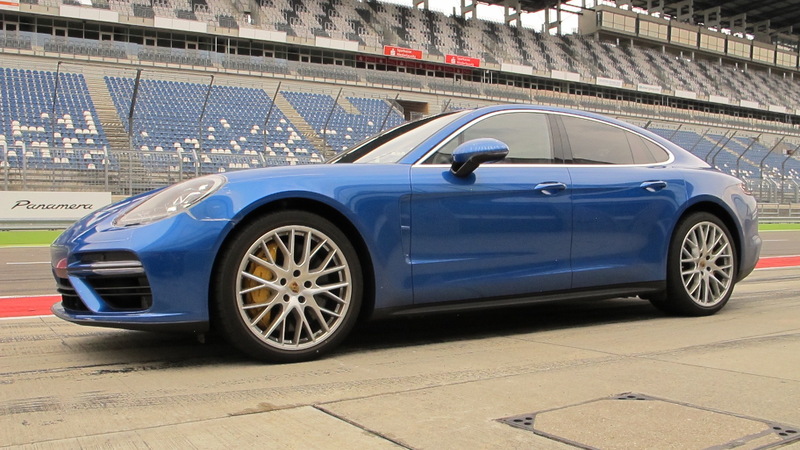 Porsche also offers optional 21-inch tires with the same profiles as the 20s. Tire choices include a specially made Michelin Pilot Sport 4. Porsche increased the size of the master cylinder to improve brake feel on all models. The 4S model’s brake rotors stay the same size at 14.2 and 13 inches in diameter front and rear, but the Turbo’s rotors grow 0.8 inch up front and 1.2 inches in the rear, bringing the totals to 16.1 and 15 inches, respectively. Buyers who order the optional carbon ceramic brakes get massive 16.5-inch front and 15.3-inch rear rotors with 10(! )-piston calipers. The 2017 Panamera gets two new engines, both related to each other and to the Audi 4.0-liter V-8. The Turbo model comes with a twin-turbocharged 4.0-liter V-8 that puts out 550 horsepower and 567 lb-ft of torque from 1,960 to 4,500 rpm. Horsepower is up by 30 and torque increases by 51 lb-ft. It should be noted, however, that this engine does not have the overboost feature that increased torque to 568 lb-ft for short bursts in the outgoing engine. The new 90-degree V-8 has the turbos mounted in the “hot V” between the cylinder heads, and it features cylinder deactivation to shut down four cylinders during cruising to save fuel. The direct injection system’s increase from 2,030 psi to 3626 psi allows for even better control of fuel burn. The new twin-scroll turbos put out 20.3 psi of boost pressure, but, as we will see, there is room for improvement in a likely Turbo S model. Not that the 4.0 needs much improvement. 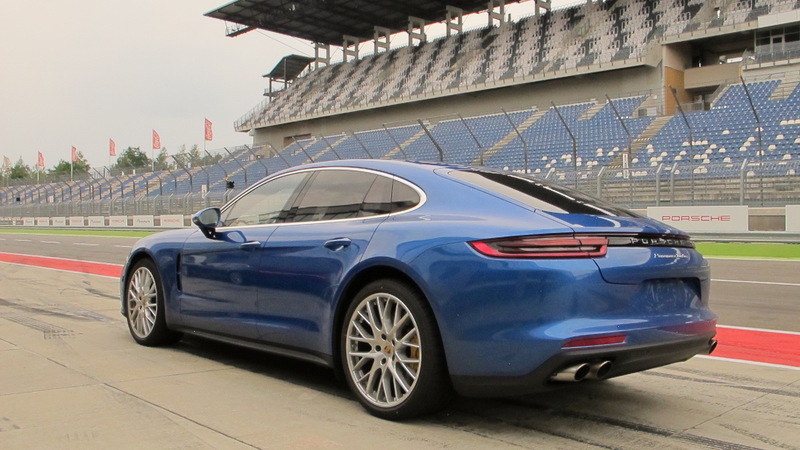 It can rocket the Panamera Turbo from 0 to 60 mph in 3.4 seconds. The base engine in the 4S model is a 2.9-liter V-6 that is basically a cut down version of the V-8. That makes it a 90-degree V-6, which leaves room for the turbos in the hot V. By their nature, V-6s are best balanced when they have a 60-degree angle, so Porsche makes up for this by adding a balance shaft to limit vibrations. The 2.9 does not have cylinder deactivation but it does have two profiles of lift on the intake cam compared to one for the V-8. The V-6 produces 440 horsepower and 405 lb-ft of torque from 1,750 to 5,550 rpm, which, again, represent gains of 20 horses and 21 pound-feet over the twin-turbo 3.0-liter it replaces. A whopping 29 psi of boost pressure helps make all that power, and the S can accelerate from 0 to 60 mph in a scant 4.0 seconds. Every Panamera sends its power to all four wheels through an all-new dual-clutch 8-speed transmission. It replaces an 8-speed automatic in the outgoing model, and it adds an extra gear to Porsche’s existing so-called PDK. That’s not to say that it’s related. Compared to that transmission, the new PDK is shift by wire and has four shafts instead of two. The two additional shafts allow fifth gear and seventh gear as well as sixth gear and eighth gear to share the same gear seats. Without the need for additional gear sets, the new transmission is 5.6 inches shorter than the 8-speed automatic it replaces, despite the fact that Porsche has allowed room within the housing for an electric motor (the previous hybrid also used a automatic). The extra shafts add about 15 more pounds of weight. Porsche says it considered 9- and 10-speed transmissions, but felt that eight gears was optimal. The extra gear increases the gear ratio spread from 10.71 to 11.17, adds a second overdrive, and, according to Porsche, cuts fuel consumption by 1.7 percent versus the previous unit. A performance luxury car needs the latest in electronics, and the Panamera has them thanks to an all-new electrical architecture. The instrument cluster features an analog tachometer front and center flanked by a pair of configurable 7-inch instrument panel screens that are controlled by buttons on either side of the steering wheel. Each screen has two “tubes” or slots for gauges and information. The left side shows speed and vehicle assist features, while the right side displays vehicle information and other forms of info, including a small navigation screen. The center screen is a new 12.3-inch unit touchscreen with a proximity sensor that awakens function trees along the left side. This screen is compatible with Apple CarPlay and it has redundant controls in the form of voice commands and some physical buttons just below it. Porsche’s new navigation system can show Google Earth and Street views. The new touch interface reduces the number of buttons considerably. Altogether these touch controls are called the Porsche Advanced Cockpit. That concept extends to the rear seat, where buyers who order the 4-zone climate control system get a touchscreen of their own to control the climate system and their own infotainment functions. Other new connectivity features consist of 4G LTE connectivity that enables a WiFi hotspot, a suite of in-car apps, a Porsche Connect smartphone app, and the ability to pair two cell phones at once. New safety systems start with a night vision assistant that detects people and animals with a thermal imaging camera and warns the driver with a display in the instrument panel. Also offered are adaptive cruise control, lane departure warning, lane keep assist, and a surround view camera system. A new system called InnoDrive uses navigation data and signals from radar and video sensors to compute and activate the optimal acceleration and deceleration rates, gear selections, and coasting phases for the next 1.8 miles. “It was courageous and good and right to ignore the Golden Rule,” Dr. Gernot Doellner, vice president for the Panamera product line, told a group of reporters at the Panamera background briefing. We’re pretty confident that Porsche can handle the manufacturing challenges of breaking the Golden Rule. Given its abundance of technology—100 million lines of code and 42 additional control modules—our only question is: Will all that tech take the control and feel away from the driver and give it to the computer? As we enter what appears to be the next step in the evolution of Porsche, let’s hope not.